Marc Addason Asher, M.D. died February 1, 2019 of heart failure. He was born on August 15, 1936 to St. John, KS farmer James Manley Asher and Pratt, KS native Lucile Turner Asher. He graduated from Kansas State University BS 58 and Kansas University, MD 62. He completed post-doctoral training at the University of Oregon, Baltimore City Hospital, and the Harvard Combined Orthopaedic Surgery Residency. He served in the United States Public Health Service and the University of Texas School of medicine in San Antonio. In January, 1972 Dr. Asher returned to his alma mater, rising from Assistant Professor to University Distinguished Professor Emeritus. He progressively sub-specialized in pediatric orthopedics and spine deformity. He established and regularly conducted several clinics throughout the State, edited the first edition of Orthopaedic Knowledge update for the American Academy of Orthopaedic Surgeons and participated in the research and development of the Isola Spine Implant System. Available from 1989 through 2011, it was at one time one of the world’s leading spine implant systems. At the end of 2002 he retired from practice and at the end of 2008 from his academic appointment. During the remainder of his life he continued to participate in the academic life of the University of Kansas Medical Center and to participate with the Kansas University Endowment Association, to develop resources to foster the advancement of orthopedic science and practice. He continued to publish clinical papers and in October, 2015 published his first book, “Dogged Persistence”. 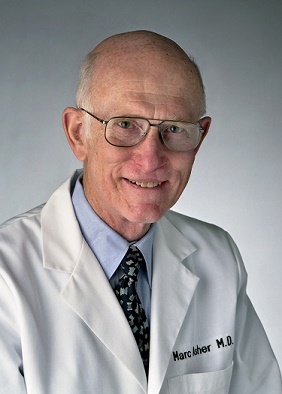 Dr. Asher published and traveled widely, presented several named lectures and was active in several professional associations, holding office and receiving lifetime achievement awards from the Pediatric Orthopaedic Society and the Scoliosis Research Society. In 1999 he was the University of Kansas School of Medicine alumnus of the year, in 2007 the Distinguished Kansan of the Year and in 2009 a Fred Ellsworth Medallion from the University of Kansas Alumni Association. Also in 2009, he was honored by the Sigma Chi Fraternity as a “Significant Sig” for distinguished achievement in his profession. In 2010 he was named a Life Trustee of the Kansas University Endowment Association. Starting in 2000, he, family members, and friends worked with the South Central (Kansas) Community Foundation (SCCF) to establish the Lucile Turner Asher Scholarship in Mathematics Endowment. To date, merit based university tuition awards of up to eight semesters have been provided to fifteen scholars. Dr. Asher is survived by his wife Elinor June Asher and his daughter Janet Asher Vreeland and her husband Bob. His extended family was a major source of pride and inspiration for him. In lieu of flowers donors are requested to honor their humanitarian charity of choice at his request. He wished to express his profound gratitude to the many wonderful patients, patient’s families, mentors and colleagues he had the privilege to know and work with.